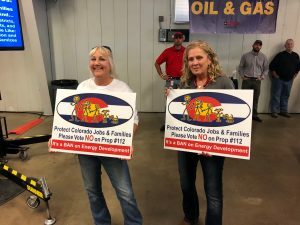 Elected officials warned that proponents of a 2,500-foot setback measure on the November ballot had awakened a “sleeping giant” and that state legislators—and now 44 mayors from across the state—“have the backs” of oil and gas workers at a #No On 112 rally today. Republican State Senate President Pro-Tem Jerry Sonnenberg, Senate Majority Whip John Cooke, State Rep. Phil Covarrubias, Johnstown Mayor Scott James, and U.S. Rep. Ken Buck, along with industry representatives, urged attendees to register to vote and talk to neighbors in order to defeat Proposition 112. 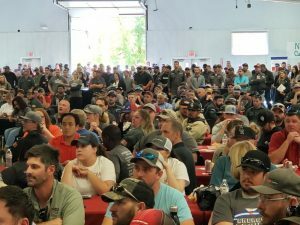 Hundreds of oil and gas employees attended the mid-day rally at the Adams County Fairgrounds near Brighton, Colo.
“I look right down here and I see young people—kids—that’s what we’re fighting for,” he added. Sonnenberg argued that domestically produced oil and gas was a national security issue, and that “extreme groups” backing the measure were endangering the state’s prosperity but the nation’s energy independence. James explained the importance of mayors coming forward as a show of strength, but also to represent and back their respective communities. “The mayors are the leaders of their municipality. There’s something special about mayors. People say, ‘that’s the guy or gal who leads my community and that’s the person that’s got my back,” James added. He rejected arguments in favor of Proposition 112 calling for “local control.” In addition to being a one-size-fits-all, anti-local control measure, James said, Proposition 112 ignored the current regulatory framework that embraces local control by allowing communities to negotiate with operators. James said the number of mayors in MAP112—which includes the top 10 largest municipalities in the state—had grown to 44 as of Thursday. Cooke’s son is a petroleum engineer. “I used to be the sheriff of Weld County and people tell me, ‘hey, thanks for your service.’ What I want to say is thank you,” Cooke said, pointing to the employees in the fairgrounds hall. “Thanks for your service. The other side wants to demonize you, criticize you for what you do. I want to thank you for what you do,” he added. “Weld County has no debt and no sales tax. And that’s not because of anything the commissioners do, nothing to do with anything the county government does. It’s about what you do. 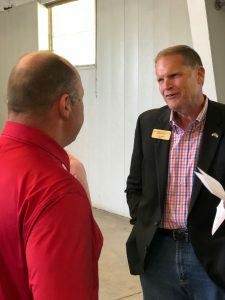 We have no debt because of you,” Cooke said, pointing to County Road 49, an industry-funded road, as well as revenue for education and new schools. Cooke told Western Wire that events like the rally was important to get out the vote. Cooke represents the core of Weld County, from Greeley south, the epicenter of the county’s oil and gas productivity. Weld County produces approximately 90 percent of the state’s oil output, and nearly 40 percent of its natural gas. Besides losing millions in tax revenue and putting the “economy in the tank,” Cooke said voters should realize that the legislature does not have the ability to backfill lost revenue should Proposition 112 pass. “They live in California and they think they’re going to spend their money here in Colorado and tell us what we’re going to do. We need to tell them to frack off,” Buck told the crowd. “They picked on the wrong group of people. They picked on people who understand what our rights are and know that we are going to take the fight right back to them, no matter how much money they spend, no matter how many lies they tell,” Buck added. “They made a big mistake with this one. They woke up a sleeping giant and they’re going to pay the price on November 6th,” Buck concluded. 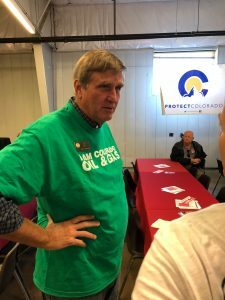 Colorado Oil and Gas Association President Dan Haley thanked the employees for making the United States the number one oil and gas producer in the world. Colorado is 7th in crude oil production and 5th in natural gas production among states, according to the Energy Information Administration. “We did what Americans do. We innovated and tested, and tried and tried again, and we have succeeded. We are now awash in natural resources,” Haley added. “There are people who want to take us backward. They want to take us from this era of energy abundance and bring us back to an era of energy scarcity. We cannot let them do that,” said Haley. “We’re able to make our environment better. If you care about the environment, you want this resource produced in Colorado,” Haley argued, adding that emissions in the state are down fifty percent, while production quadrupled over the past few years. Proponents of Proposition 112, he said, were missing the real story of the effect of the proposed setback expansion. Colorado Petroleum Council Executive Director Tracee Bentley, thanked oil and gas for the educational opportunities afforded her children in Weld County schools. “It  will decimate our economy. It’s predicted that if 112 passes, it will look like the recession of 2008 and 2009. You know the irony here, guess what industry pulled Colorado out of the recession, faster than any other state in the country? We did,” Bentley added.